June 01, 2003, L. & E. Crabo. 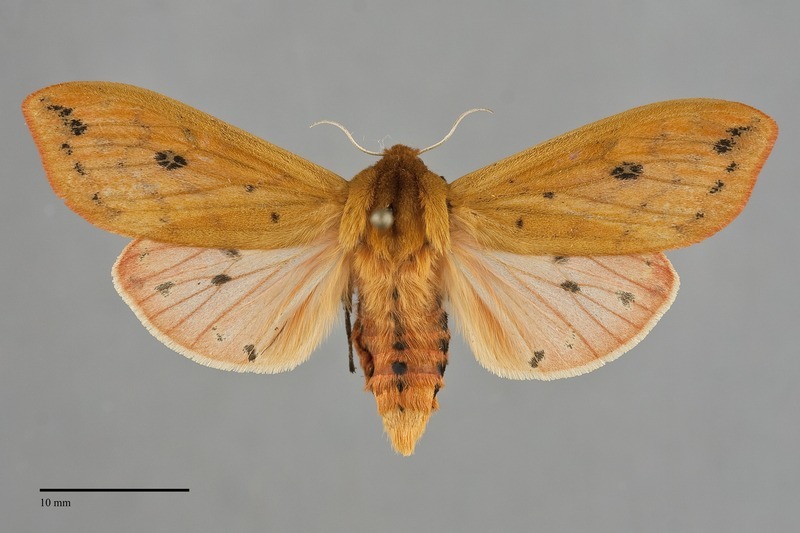 Pyrrharctia isabella is the adult of the familar black and chestnut colored woolly worm. 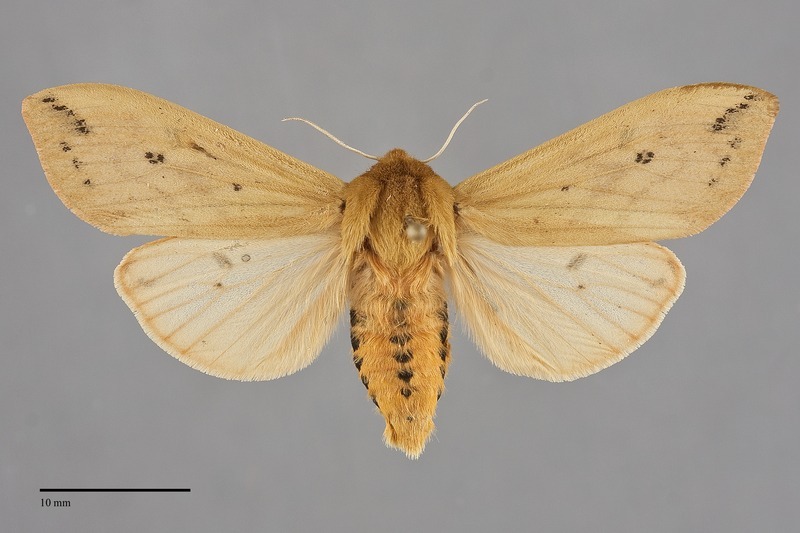 It is a medium to large tiger moth (FW length 22 - 26 mm). 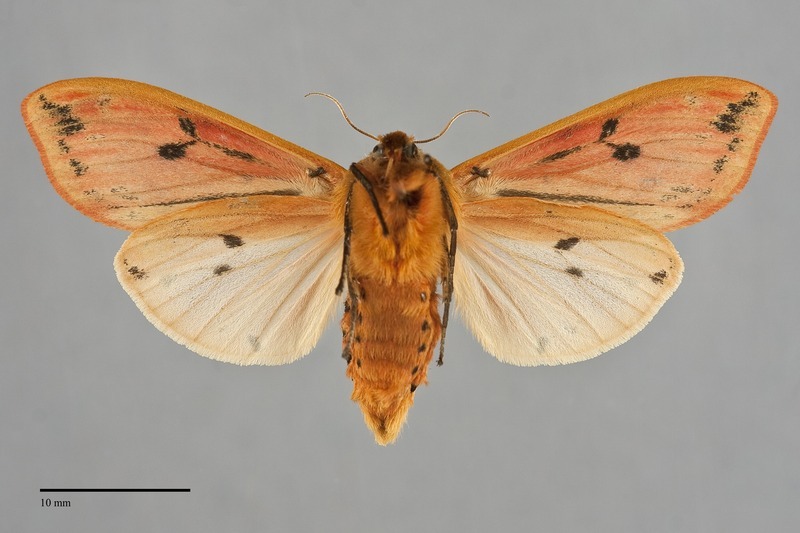 The forewings are uniform light to medium orange brown, with an red orange fringe in some specimens. Most of the transverse lines are faint gray, nearly absent in some specimens, but some are marked with a series of powdery black spots on the veins. These spots are present on the subterminal line in all specimens, but a few spots are often present on the antemedial line and the posterior portions of the median and postmedial lines. A group of three to five black spots comprise the discal spot. The hindwing is light orange brown to orange with black discal spot and variable black spots near the outer margin. The head and thorax are the same color as the forewings while the abdomen matches the hindwings and is marked with lines of black spots. The narrow antennae are light ochre brown. 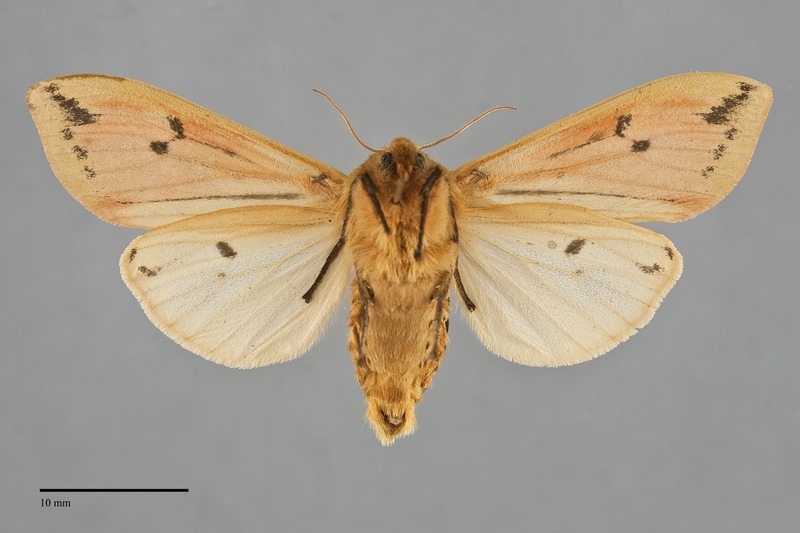 This species is unlikely to be confused with other moths. Larva is covered with dense tufts of hair, black at the head and tail, and red in the middle of the body. It is illustrated by Miller & Hammond (2003). This species is widely distributed throughout much of North America at lower elevations. In the Pacific Northwest, it is particularly abundant west of the Cascades in coastal grasslands and rainforest, mixed hardwood forests at lower elevations, wet meadows in the Willamette Valley, and in mixed hardwood-conifer forests at higher elevations in the mountains. East of the Cascades, it is more limited to moist meadows in riparian zones. Pyrrharctia isabella is widely distributed in the Pacific Northwest. It is common in low-elevation mesic habitats as far north as the 51st parallel. The distribution is spottier in aridlands, although it is common in the western part of the Columbia Basin and has been collected in southeastern Oregon and Idaho's Snake River Plain. This species is widely distributed. It is found throughout the eastern part of North America. It has a spottier distribution in the west and appears to be absent from drier parts of the Great Plains and intermountain region, including all of Nevada. In California it is found along the coast as far south as Los Angeles and also occurs in the Sierra Nevada. Pyrrharctia isabella has been found from late spring until early fall, but adults are most often collected in June and July. It is nocturnal and comes readily to lights.